Google Trips is a handy tool to organize your vacation or business trips from the mobile. With free download in the Android and iPhone application stores ( iOS) , the user creates a personalized script plan for each destination, ideal also for those going through different cities or countries. It is possible to save tickets and hotel bookings and find tourist attractions, places nearby and even do a daily planning. A complete assistant so you don’t forget anything. And the best: you can download everything to access offline on the cell phone without the need for internet. Below we show you how to use Google Trips to organize your vacation. - Download and install the Google Trips app on your phone. On the main screen, enter the destination location in the top text field. Then choose the country or city in the listing displayed by the app. - In the screen that opens with the photo of the place, touch "Create a trip". Add a custom title, start and return dates, and complete "Done". - The trip will be added to your home screen. Just touch it to customize. All the categories to organize your App will be on this list. To start, we will add reservations (can be hotel, tickets, tours and more items). Select "Reservations." - To add reservations, touch the purple button at the bottom of the screen and select the service, which can be restaurant, car rental, hotel or ticket reservations. At the next screen enter all the information and press the save button at the top right. The item will be added to your reservation list. It is worth remembering that Google Trips has integration with Gmail. When you receive a flight confirmation via Google's email, it should also appear on Trips - automatically. - In the "Things to do" category, you can get an idea of the tourist attractions and interesting places in your travel destination. The first suggestion is that of "Top Spots". - The user can still find the subcategories in the menu, such as "For You", modern art and more personalized options related to the place. By touching one of the indicated places you can find detailed information, with reviews of who has traveled, phone location, website, map, opening hours. Favorite the places using the stars (they will be saved in another personal list to follow). - To find all of these favorite places, select the "Saved Places" category. The app will show a list of scripts saved by you for quick access. - In order not to miss anything, you can plan the days during your trip in the "Day plans" category. The app offers some suggestions, with a route of places near your location or hotel. But, if you prefer something more personalized, touch the "+" button to edit your day. - To create your day, first tap the filter button at the top and select whether the program will happen in the morning, afternoon or all day. Prioritize places saved by you (in the blue key) and choose the day of the week. Confirm with "Done". Then all the interesting places with blue dots will be marked. Don’t want to waste time? 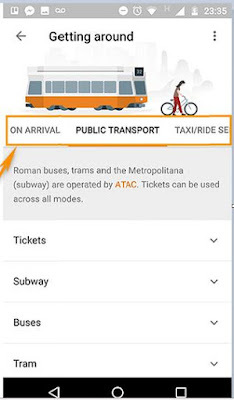 Tap the magic wand button for the app to create smart routes for you within your time availability on that destination. With each touch the plane changes with new options. When you find one you like, select the save button to save. - The "Food and Drink" category shows everything about food and beverages. In the "Overview" tab you know the traditions of local cuisine. On the Top Spots tab are the most popular places close by and divided by categories. 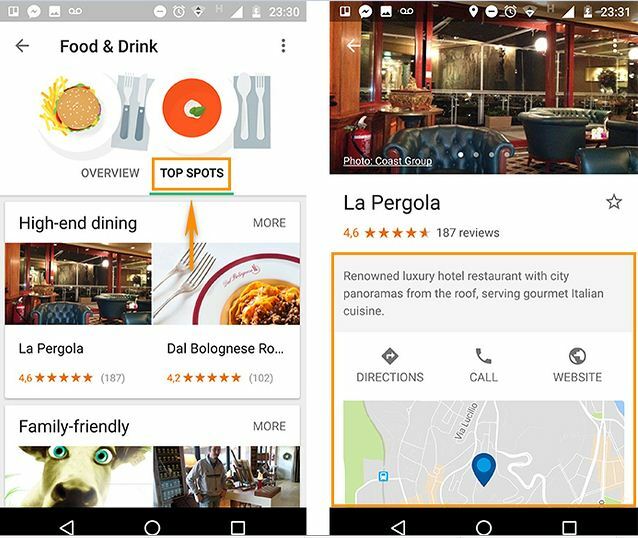 Tap one of the establishments to get more details like location, map, phone and website. - In the "Getting Around" category, the user can find a complete guide to getting around and getting around the city, ideal for new routes. There are tips on how to get there, public transport, car rental service, hiking tips and bike paths. - In "Need to Know" there is all the information you need to know for "Health and Emergency" (with on-site medical centers and 24-hour pharmacies), "Shopping", "Money" and "Communications". This planning can also be downloaded for offline access on the mobile. 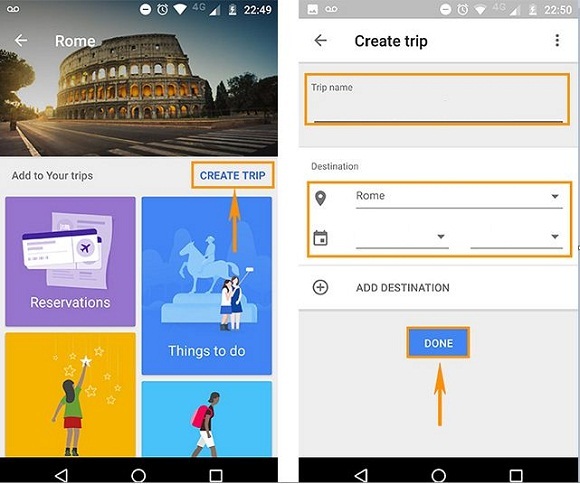 To do this, simply access the trip itinerary in the initial screen of the app "Your Trips" and activate the key next to "Download". It will turn green and indicate when the plan is downloaded to the smartphone (Available offline).